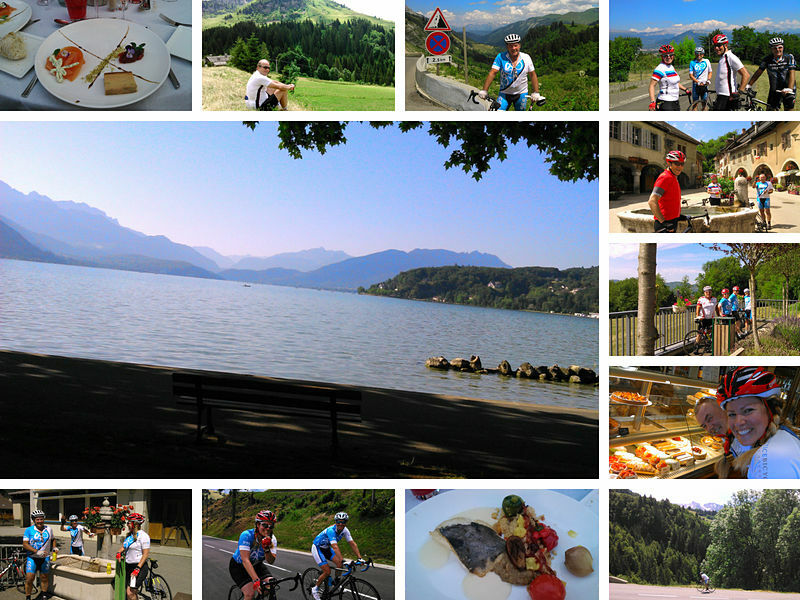 What better way to describe the Lake Annecy Cycling Vacations other than pure escapism! With Practice Bicycle living the roads around Annecy since 1998 it’s not surprising that this cycling vacation takes your cycling somewhere special. This picture perfect location with ride routes tailored to every cyclists dreams and restaurant lunch spots that equal the cycling adventure! Lake Annecy Cycling Vacations perfect for you! This afternoon escape away from our blue paradise home with a welcome ride into the heart of the French country. This area between Annecy and Geneva is dotted with tiny villages and farming communities with quiet tranquil roads waiting to be explored by bike. This patchwork quilt is just as spectacular as the Grand Alps but in its’ own unique and different way, passing by the rock of La Mandallaz and the Chateau de Montrottier as we loop back in the direction of Annecy and panoramic views of the Crêt de Châtillon 1699m high over Lake Annecy. Lake Annecy cycling vacations are all about variety, today it’s the Park Massif des Bauges region, one of our favourite areas with a wonderful network of quiet valley roads available to you starting with the comfortable grades of the climb of Col de Leschaux (12km, average 4%, 900m). This area is popular in winter with the skiing fraternity, just as breathtakingly peaceful in summer by bike. With an endless choice of ride routes we will head down one of the beautiful valley roads all with amazing different scenery and work up an appetite for a lunch stop in our village ‘local’! With a gentle start to the day following the contours of the Lake and passing by splendid homes with the prime spots of this beautiful part of the world. It’s not long before the real fun begins as we slowly take on the slopes of the Forclaz, with breathtaking views all the way to our destination on top of the lac! On route take a break at the Eglise de Saint-Germain, a little church possibly built for just that reason the perfect spot for a Rest and break! One of the many pleasures of Lake Annecy cycling vacations is the opportunity to explore in all directions. Our pick of the rides today is the tranquility of the French country lanes as we explore amongst traditional tiny villages and away from the Grand Alps. This perfect ride show cases the rolling green fields of France with the Semnoz Mountain Forrest and the spectacular jagged silhouette of the French Alps for the backdrop. This is one of the Practicebicycle team local favorites into the Grand Alps, we have many Col’s of varying difficulties and duration accessible from Annecy and the clear blue waters of the edge of the Lake, but the Aravis Mountain range is one of the most spectacular. It’s a challenging ride but the spectacular views and sense of achievement as you reach the perfect lunch spot at Le Chinaillon, make it well worthwhile.  Rustic food in a picturesque setting where locally produced flavours await you!